Well, the "super-fast" is true...but this is by no means a real fondue. Meant to be quick, easy, and microwavable, this recipe certainly has good intentions, but it's really not worth making UNLESS you have an actual fondue pot (or at least a crockpot or similar device). Use whatever veggies you want for dipping (I just bought a bag of broccoli/carrot/cauliflower mix), but beware of the cooking time: four minutes was way too long for microwave-steaming. Most of the veggies ended up slightly limp, which in turn made it very hard to really dip them in the fondue. I'd suggest doing a true stovetop steaming, followed by an ice water bath to achieve the perfect texture. The fondue itself actually has great flavor. 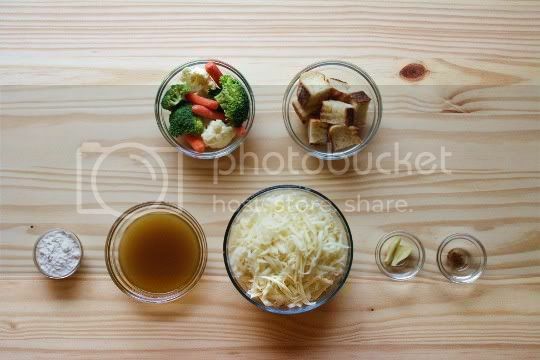 A simple combination of flour, vegetable broth, and Gruyere (or Emmenthaler, or any other kind of Swiss) is mixed and microwaved until melted and smooth. A clove of garlic and just a pinch of nutmeg are also added, and it's amazing how much these add to the authenticity of the cheesy and rich fondue flavor. 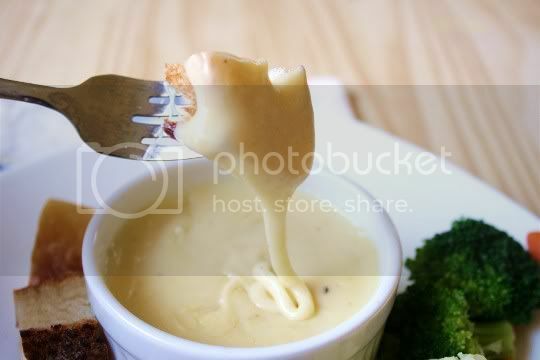 The problem, unfortunately, is the fondue's texture. But hey, it's made in a microwave, so I guess my expectations shouldn't have been the highest. You really have to eat this stuff ASAP; otherwise, it becomes thick, stringy, and rubbery, and really starts to resemble more of a soft cheese spread. 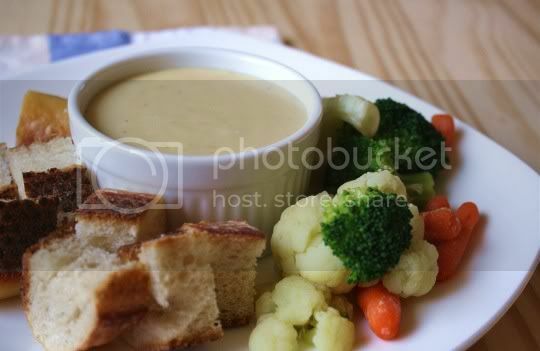 In fact, it becomes so thick that dipping turns into digging, which is why the veggies need to retain some firmness. If you do decide to attempt this recipe, I would NOT go the microwave route. Steam the veggies the proper way for starters, and if you have an actual fondue pot, use it. The cheese needs to be kept warm, otherwise this will end up an epic fail. Make again? Probably not. I still think the whole fondue thing is a bit too trendy, and certainly not worth all the fuss...unless you're doing a themed fondue party or something. Vegan variation: Substitute a vegan cheese. Hell, maybe the texture problems will go away! This looks delicious and healthy for sure!